Some San Francisco residents believe that orthodontic treatment is only useful for cosmetic purposes, but the fact is that misaligned crooked teeth or an underbite or overbite can cause serious oral health problems. To use the technical term, an overbite or underbite is a malocclusion that occurs when the upper teeth or lower teeth do not meet accurately. With an overbite, the upper teeth protrude forward over the lower teeth, while an underbite is the opposite where the lower teeth protrude over the upper ones. An overbite is often hereditary, but can also be caused as a result of thumb-sucking when a child or prolonged bottle feeding. An underbite is also often hereditary and is usually present at birth. In this case it is usually a misalignment of the lower jaw. Both can be caused by unequal growth of the jaws, but can also be a result of tumors or trauma. Both types of bite can cause problems with eating, problems with speaking, gum damage, chronic jaw pain, headaches, earaches, halitosis and bacterial infections, sleep apnea, and tooth decay as a result of excessive wear of the enamel. A severe underbite or overbite may require jaw surgery. In the case of an underbite, a qualified San Francisco jaw surgeon such as Dr Alex Rabinovich separates the rear part of the jaw bone from the front part and modifies it in order to make the correction. This enables the part of the jaw bearing the lower teeth to be repositioned further back. An overbite may also require jaw surgery. In some instances it may be necessary to carry out surgery on both jaws. 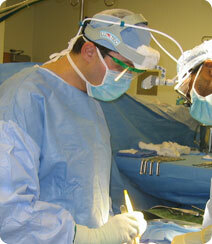 Dr Rabinovich is a San Francisco jaw surgeon who is also a highly experienced oral and maxillofacial surgeon. He has many years of experience of carrying out jaw surgery to correct all types of problems, and partakes in medical missions abroad where he performs jaw surgery for children in need on a voluntary basis. Whatever type of problem you have with an underbite or overbite, you can be certain that San Francisco jaw surgeon, Dr Rabinovich, has the answer. He fully understands the embarrassment that can result from these conditions and he will work with you in order to find the best solution. He offers all patients a completely free consult when he can assess your problem and suggest the best way forward. You can book an appointment by calling the office on (415) 817-9991 or simply clicking on the contact Us link at the top of the page.